Nice article !! Very impressive way to communicate the feelings with developers. A gud article About the importance\strategies of testing to Correspondent entities. Very well written (y). It may establish good understanding relationship between Testers and Developers. Sorry but I dont agree with pushing the blame to development! Dont blame the developers for a poor culture likely put in place by PMs who cant control the business. Of course devs are aware of TDD etc. You ask the question why dont they do it. Well ask yourself a question "Why do you accept the code if TDD and Unit testing hasnt been done?" Why dont you as the tester communicate to the PM and Business and be the defeneder/champion for the development team and sell "them" on TDD vs. acting like its the development teams issue alone. Thank You Jason for your comment. I respect your opinion. The purpose of this article is not to put "blame" on developers, it is a suggestion. You may or may not accept it, it is your choice. I have already said in this article that not all developers avoid unit testing. Some developers ignore it because of the time pressure. You can share this article with your PM or business people so that they can understand the unit testing is beneficial and time saver for whole organization. I agree with Jason on several of his points -- I would add, QA can only suggest unit testing, the ownership is on the development team. Once an application developer myself, I already knew 99% of what was introduced, its not new -- they(developers) know. If you want to be useful, introduce them to Uncle Bob Martin, if they don't already know who he is. And if they do -- and they still don't do unit testing -- its not getting done! It will require a push from the top to drive the importance of this type of testing. Jason, it is not the tester's job to make request to a manager that you do your job as a professional developer correctly. Your statement is the same as a truck driver saying that all of the cargo got crushed because he had to drive too fast because the manager gave him a schedule that was too short. The driver is accountable. The developer is accountable. It is even the wastage of time while communicating to PM and not accepting the build from a Tester.Developer should include the time cost for unit test when giving estimations before developing any feature. Good post Saad. Unit testing is essential. How about if there could be some way the automation team could write the unit tests for them (they wouldn't be called unit tests anymore then :) ). Off course there are a lot of obstacles there, firstly exposing code to QA, which usually folks don't agree with. Next agreeing on explaining the architecture / what's going on inside on a test module level. Nonetheless I hope might be a nice approach for automation and dev folks. In microsoft there are certain resources who help developers in writing unit tests. but these resources provide environment like creating mocks and stubs to ease the unit testing process. but they still don't write unit tests for developers. Writing unit tests is always a developer's responsibility. Managers need to provide a culture and demand that unit testing from them. Writing unit tests will always be developer's responsibility. 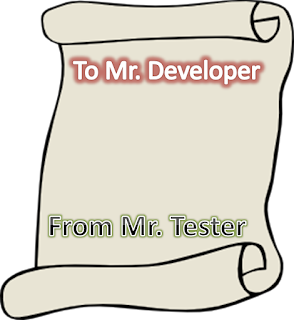 Loved the way, u have shared the viewpoint of Tester to Developers. I know it is the English standard, but it is tiresome to see a dialog that perpetuates the assumption that all developers are men. I would love this 10,000xs more if you wrote it without using Mr. and instead just referred to your fellow developer. Well I have written this letter to only 1 developer which I assume is male. I have never said or assumed that all developers are male. Helpful for freshers who are starting coding! !Learned a lot from unit testing. A good article that highlights the relationship between Developers and Testers. I agree with other comments about Business culture and Project Management. Sometimes the business focus will be on delivery and dates met, rather than quality. Unit Testing is the gateway to Quality of an application. Article written brilliantly. Keep it up. Very good information. Its very useful for me. We need learn from real time examples and for this we choose good training institute, we need to learn from experts . So we make use of demo classes . Recently we tried java demo class of Apponix Technologies.